Grandfather Jacob, his wine glass raised, as if standing for communion at his Lutheran church stood addressing the Mengelder family on Thanksgiving Day. Forty-eight of us crowded together at my grandparents’ home for the annual family reunion. “Does this sound familiar?” Jeremy said quietly, leaning towards my ear. “You think? Yes, just a little.” I said, smiling. “But, this stuff is important to him. He just wants to remind us of the virtues of ‘family values’, our ‘beginnings and rich heritage’, all of the above.” I said. We all bunched together, anxiously waiting for him to finish while he delivered his speech, “embracing family, country, and freedom” once again. “Hip, hip, hooray! To our flag, freedom, and the grand ole U.S.A.”, shouted Chad with a smart mouthed smirk, gulping down his Coke. “Here, here! Let us pilgrims march forth into victory. And dinner.” declared John. “Cheers to the red, white and blue. Cheers to me, and you.” said, Ben, our ‘poet’. My cousins enjoyed a good laugh, not meant to be at the expense of grandfather Jacob. He just tended to be a bit long-winded when they stood impatient, waiting to load their plates from the bounty spread out over the buffet table. When he finished and the prayer said we filled our plates and found seats at tables spilling out of the dining room, living room and kitchen. It was enough to freak out a fire marshal. We made a noisy bunch, laughing, joking, everyone talking at once. Grandfather Jacob sat at the head of the dining room table in his chair looking like a proud peacock, patriarch of the family clan. His once thick silver locks now ringed his pink pate like a wispy white halo. His wire rimmed glasses framed kind, but intense, dark brown eyes. His face, the color of old ivory bore the deep lines, wrinkles and aging spots of his eighty-six years. He worked on the mounds of mashed potatoes, dressing, and corn custard beside a half eaten turkey leg. Another small plate with salad and rolls lay beside it disappearing just as fast. While eating he listened to bits and pieces of everyone’s conversation around the table, not missing a beat to add his input on all. Grandmother Lisle sat beside him, her dainty hands cutting through a slice of turkey while discussing her Sweet Potato Pie’s ingredients and secret to a “flakier crust” with aunt Libby. Sitting beside my uncle Heinrich at the other end of the table I nodded politely to all his ramblings about the things wrong with our government, and all that needed to be fixed in Washington, DC. It was a typical holiday gathering, some watching football games on TV, my cousins in the basement playing pool, and the women cleaning up in the kitchen, gossiping while they worked. Grandfather excused himself to go watch the boys play kick ball, and “get some fresh air”. His pallor, and quiet mood seemed a bit off as I watched him through the opened window above the kitchen sink where I helped with clean up. Their noise drifted in, as did the heat from the unusually warm day in late November. With some nudging from the boys, Grandfather relented and joined them in a game of kickball, but had a harder time keeping up with the ones he once bounced on his knees calling his “little patriots”. He jostled around, returning the ball a few times when suddenly he clutched his chest and collapsed to the ground. We all ran out. My cousin wasted no time calling an ambulance. Grandmother Lisle shook her head. “No, Jacob! You cannot leave me. Not now. There is no time for you to be sick.” she said, her voice breaking. She sobbed, imploring our help. My uncle and cousin tried CPR, not waiting for paramedics to arrive. But, it did not help. A final breath and he lay quiet. A white cloud moved across the midday sun, his eyes staring upward, unmoving. A strange calm came over me as I looked down at his still form, realizing we had just lost him. In my mind I had an image of grandfather Jacob soaring through clouds, into the heavens, enlightening all the angels carrying him. And God smiling, while he “went on, and on,” his speech to all who would listen. When the paramedics arrived their attempt to revive him was futile. He was rushed to ER, but was pronounced dead from a “massive coronary,” turning our day of “thanks” into one of mourning. “Moni,” – he always called me that – “do not memorialize me when I am gone. Learn the truth of our family’s history. My grave will be but a stone to the quarry you will come to find. Learn our heritage. Write our story that it may be remembered. The patriotism to our country will live on in the hearts of the descendents that carry the banner of our beliefs. Those who value the words honored in our constitution will uphold the principles our nation’s founders swore to live by,” he’d written in a letter to be given to me upon his death. It was saved and kept with his old German Bible, passport, photos and naturalization papers. As the creator of the literary press research paper, THE QUILL AND QUEST while in college I developed a web site and blog, enhancing it with new features. By updating our site daily our readers could read articles, post and blog on political issues at home and abroad. Our newest feature; genealogy and archival research on diverse ethnic groups became a special project promoting interest, inquiries and questions from people wanting to research their ‘family tree,’ many of them becoming regular contributors or bloggers. Its success drew the interest of other professors and students majoring in history and genealogy studies in other schools. German, Russian and East European Jewish ethnic history became the most popular of our research studies project. And my obsession. After earning my Master’s degree in history and genealogy studies I began assessing what I had on my own family history. Grandmother Lisle and I went through old documents, files and photos during our coffee talks, always with a plate of her “fresh from the oven,” Oatmeal Raisin cookies, my favorite. 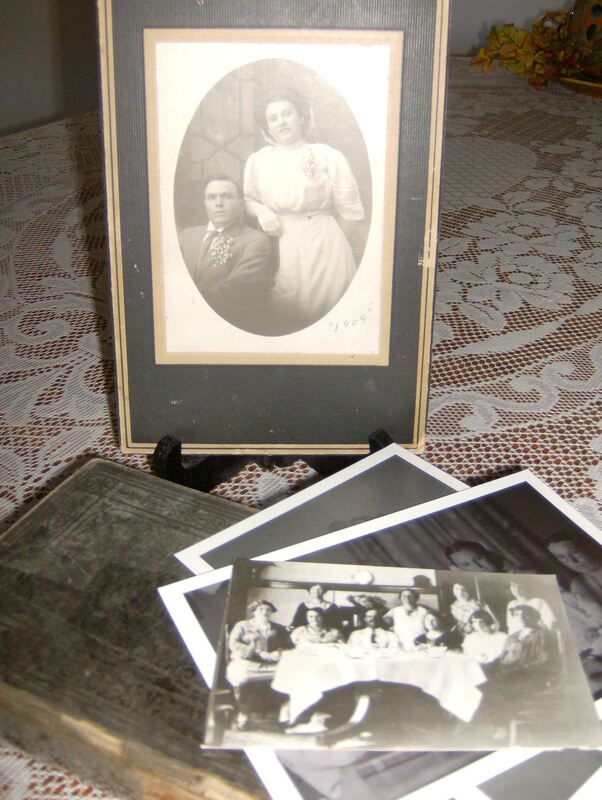 Carefully turning pages of grandfather Jacob’s German Bible, I read the scrawled names, birth and death dates on family record pages, personal notes, mementoes and bookmarks stuffed inside, even favorite scriptures underlined and noted. The worn, antiquated passport of my great-grandfather with pages as fine as tissue spilled loosely into my hands, well over a hundred years old now. Names and dates of family members’ immigration were scribbled on lines in Old Russian Cyrillic script. Then she brought out another box, dust settling on it as it had been stored, hidden away, its contents giving off a musty, old smell. In unbelief I watched as she pulled things out, and it was then I learned the secret kept, like a hidden piece to a puzzle needed to complete the picture. And I realized the reason for grandfather Jacob’s fanatical patriotism. Months later grandmother Lisle became weak and frail after suffering the flu the previous winter. Unable to regain her strength and recover she died peacefully in her sleep. Our family once again came together to mourn their loss. Like grandfather Jacob she believed anyone could be, “an American forging paths with a spirit of adventure and greatness,” like the first patriots and immigrants who came to shore pioneering the way. We buried her a week later beside grandfather Jacob. Their adjoining gravesite now held another fresh bouquet of yellow daffodils, her favorite. It was Memorial Day. While applying for a current passport and visa papers to travel abroad I received a call from the U.S. Genealogy Department of History and Research in Washington, D.C. They hired me, and I was sent on assignment to Europe with a team of archivists. Note: The above story is fiction, but the photos above are mine. They are ones of my own family and grandparents. The story is based on facts, some true, some from other resources to create the fictional story of The Mengelders of Omaha.